Sea Wave: 3 – 5 ft. Swell Wave: 3 – 5 ft.
It’s done! Everyone was up early and out on the fantail (the aft deck) right after breakfast. Although the waves were a bit higher today the sun was bright and the temperature mild. In the complete reverse order of how the old mooring was brought in on Wednesday the new mooring was deployed. People worked from 7 this morning ’till 4 in the afternoon to get this put out properly and safely. 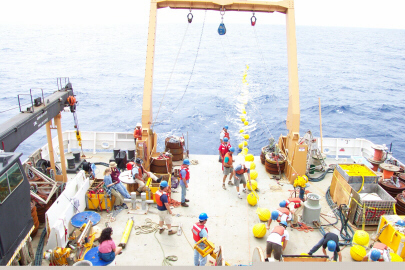 Near the very end, after paying out close to 4000 meters of rope, the glass balls were attached, next the release valve, and lastly the anchor. The anchor consists of 3 large solid steel wheels that weigh close to 10,000 pounds! What a splash it made when it hit the water! Now there is a sense of relaxation and success. Tomorrow the onboard computers will check for signals from the mooring and then we will be on our way. The glass balls being deployed. The large objects by the A-frame are anchors. The left side is for the IMET Buoy and he right side is for the TAO Buoys. TAS Jane Temoshok in the small boat going out to the buoy. 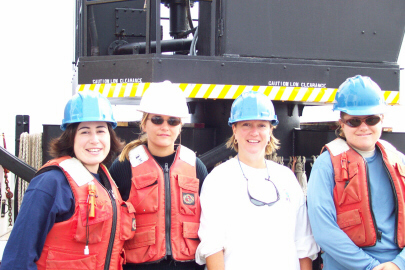 Women in hard hats on the deck: Claudia (Chile), Charlotte (France), Jane (U.S.), and Olga (U.S.) are ready to work on deck. Gordy Gardipe from the engineering crew says that oftentimes seabirds fly onto deck during the night. They are attracted to the lights on the ship and they fly directly into it. Sometimes they die but sometimes they just get disoriented. Gordy has a special box that he uses to capture the bird. He waits until daylight and then sets them free. He said he used to release them right away but often they would just fly right back and do it again. That’s why he waits for sunlight. Question of the day: What does a petral (type of sea bird) eat? 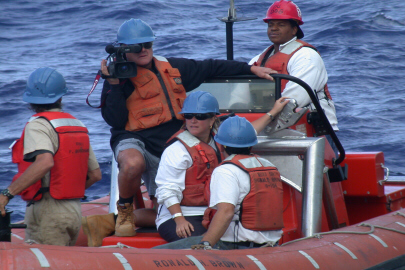 This entry was posted in 1990-2002, Jane Temoshok, NOAA Teacher at Sea and tagged anchor, EPIC, glass floaters, Mooring, noaa ship ronald h brown, seabirds. Bookmark the permalink.